Tone and timbre are terms that are often confused and misunderstood. They are related, but are quite different things. If the following explanation gets too technical, just think of tone as the type of changes you can make with the EQ knobs (bass, middle, treble, etc) on your amplifier, while timbre is the "character" of the different sounds you can get with different pickups. Boosting the treble using the neck pickup doesn't make it sound like the bridge pickup! Boosting the middle with a strat doesn't make it sound like a Les Paul humbucker guitar! Comparing instruments is an easy way to think about timbre. Both pianos and guitars create sound by striking a string, and they can easily be amplified with similar tones, for a good balance of bass, middle and treble. But most listeners can easily distinguish between the sound of a piano and guitar. Likewise, using the tone control on your guitar is an easy way to think about tone. This control rolls off the treble response, giving a more mellow tone. Adjusting this control affects the sound very noticeably, but it still is quite recognisable as the same guitar. A plucked guitar string produces a combination of frequencies. For example, when you pick an open E string, the note consists mainly of the E you picked (called the fundamental or 1st harmonic), but also includes quieter levels of the 2nd harmonic (an E one octave above the fundamental), and further harmonics. 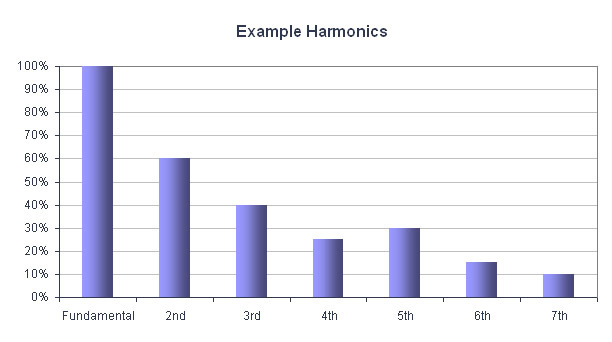 The 3rd harmonic is very close to a B, the 4th harmonic is another E two octaves above the fundamental, and so on. 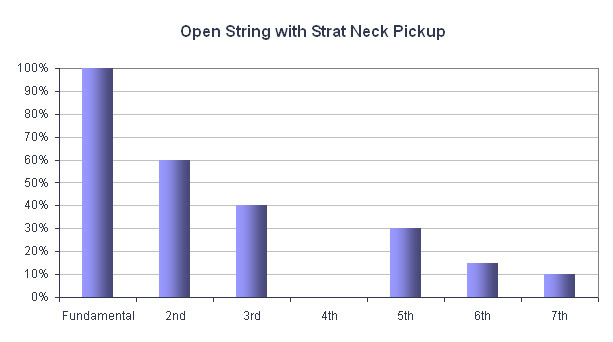 Here's a picture of the levels you might see in a plucked string. This sample has a marginally stronger 5th harmonic. True harmonics go to the limit of human hearing, or your amplifiers capabilities, whichever comes first! A higher level of upper harmonics compared to the lower harmonics and fundamental, produces a brighter, or sharper tone. Likewise, you can reduce the proportion of higher harmonics by using the tone control on your guitar to give a more mellow tone. 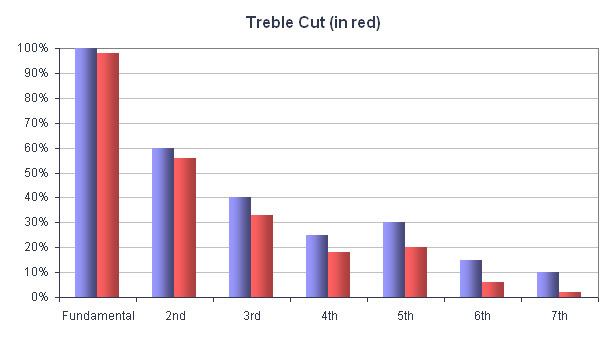 This pic compares the same sound above with treble cut. Notice that there is still some "character" of the strong 5th harmonic, but the higher the harmonic, the more cut. Timbre is determined by the relative levels of different harmonics. It is true that a sound with weak high harmonics will be perceived as having a mellow tone compared to one with strong high harmonics. Variations in timbre on your guitar are produced by an enormous number of factors from pickup design and position, the natural resonances and damping in your guitar due to the wood used (that's a different sort of timber!) and its construction and shape, the gauge and age of your strings, your playing technique, where you fret and pluck the string, and so on. You can set a strong tone emphasis with a wah pedal (which sweeps a frequency response peak), however, different pickups still sound quite different, even through this kind of radical tone shaping. With this enormous number of variables you can see that it's hard enough to get identical guitars to sound the same, and no amount of EQ will get a strat to really sound like a Les Paul, or vice versa. An explanation of the unique sound of the strat neck pickup illustrates the concept of harmonic content in different timbres. If you play an open string it contains a strong fundamental, as you would expect, a relatively strong 2nd harmonic, an average 3rd harmonic, and no 4th harmonic at all! Why such a difference between the 4th and other harmonics? The string vibration itself contains the motions of the fundamental and all of the harmonics. The fundamental vibrates between the nut (or fret) and bridge, as you would expect, with the strongest vibration half way between these points. In addition to this main vibration, there are also components identical to you playing all of the harmonics at the same time! (For non-guitarists, a harmonic is played by touching the string at a point along the string to prevent the fundamental from sounding, then plucking the sting normally). The single coil strat neck pickup reads the string at a single point exactly 1/4 the length of the string from the bridge (where the 24th fret would be), although some more recent 22-fret strats have the pickup a fraction closer to the bridge. So the 2nd harmonic component of the string vibration has its node (the "dead spot") over the 12th fret, the same as if you played a harmonic by damping the string over the 12th fret. This 2nd harmonic has its largest string vibration at 1/4 the length of the string from both the nut and bridge - that's over the 5th fret, and the neck pickup. Hence the strong 2nd harmonic. Now consider the 4th harmonic which has nodes at the 5th fret, the 12th fret and the neck pickup - there is no 4th harmonic vibration over the neck pickup. This strong difference in harmonic levels plays a major part in the unique character, or timbre of this pickup. A way to prove this is to play this harmonic by damping an open string above the 5th fret (making sure not to pluck the harmonic at its nodes over the 12th fret or neck pickup). You will hear almost nothing from the neck pickup, but a strong note if you switch to the middle or bridge pickups. This illustrates the difference between tone and timbre. The 4th harmonic is just not present in this example, and no amount of tone adjustment, such as middle EQ boost, can bring out something that's not there in the first place. Even worse, this tone adjustment would need to change frequencies as you play different notes, and work at different frequencies for each string, which is not possible with a single pickup. So you can see that tone adjustments cannot create new timbres, they can only bias existing timbres. Other devices (such as overdrives and enhancers) can add new harmonics, although just how musically relevant they are depends on a lot of things, including your own personal tastes! Of course, as you fret different notes, the position of the nodes move, and you get a progressive change in the harmonic content of the notes. Again, because of this neck pickup position, a note fretted on the 12th fret contains no 2nd harmonic. Humbucking pickups don't sound fatter just because of the additional coil windings involved. A typical humbucking pickup "reads" the string over about a 3 cm length, so any harmonic nodes which occur over one coil are unlikely to also occur over the other, although the level of this harmonic will still be fairly low. These pickups have a more even and fuller sound, with a little less distinctive character. The story doesn't quite end here either. Harmonic content usually varies over time. With a guitar string, the higher harmonics generally dissipate faster than the fundamental. On other instruments, the harmonic content can vary in different ways. For example, a sax player can blow a note, then blow harder to brighten the timbre. It is the harmonic content and the way it varies over time which is called timbre, and this is how we differentiate one instrument from another. Well, I guess no discussion on tone and timbre is complete without talking about the holy grail we're all looking for - ultimate guitar tone. If you read my other pages, you'll know my preference is for that slightly "pushed" sound, just as a good valve amp starts to overdrive. I know I'm not alone, and I also know that for others, the ultimate tone is as dirty and nasty as possible, while others want it dead clean; not even a hint of distortion! In the context of 'guitar tone', I think most people are talking about timbre - that special sonic character that defines both you and your instrument. I'm not going to be pedantic here, even though I've just explained above why tone and timbre are different things, I'll now use the word tone to mean this unique sound we crave. Even though we each have different ideas about our ultimate tone, I think we're all looking for a rich sound - rich in harmonics, that is. Lots of harmonic content = lots of 'tone'. If you have lots of harmonic content to start with, you can easily use other sound shaping tools (tone controls on the amp, in particular) to sculpt your favourite and unique sound. It's a bit like giving an artist every colour he could wish for to paint a picture. If you only give him a pencil, he can still draw a great picture if he's really good, but has limited options. So, back to guitars, we want lots of harmonics, and different players will use other sound shaping tools to tailor their own sound. A natural plucked guitar string will contain a strong fundamental, with less strong harmonic content. The higher the harmonic the lower its level. The first challenge is to make sure you have a strong fundamental, so let's get the bad news out of the way. Heavy strings and a high action almost guarantee great tone. If you have any doubt, listen to Stevie Ray Vaughan's tones. There are good reasons for this. The fundamental is loudest because it vibrates the most. If you have a low action, fret rattle kills a lot of the fundamental, emphasising higher harmonics, giving a thin sound. Even if you hear just a hint of fret rattle at the start of a note, you have lost some fundamental. Likewise, heavy strings give a stronger response on the fundamental without sacrificing upper harmonics. In practice, we all find a compromise on string gauge and playing action, but don't be afraid to experiment with a heavier gauge and a higher action. Most likely it will feel quite uncomfortable at first, but I've found that practicing on an acoustic helps make an electric feel easier to play. Of course, it should be a 'real' acoustic with heavy strings and high action, not one of those thin sounding acoustics set up to play like an electric (noticing a trend here?). Good quality pickups are important. Cheap pickups are often microphonic (subject to feedback) and have poor clarity. Even if you have a cheaper guitar, replacing the pickups with professional units can make a big improvement. Vintage to 'slightly hot' pickups deliver the best balanced tones, while really hot pickups are great for overdrive, but usually emphasise the mids when played with clean settings. Single coil pickups generally convey more character, while humbuckers generally give smoother overdrive. I'd recommend you buy the best guitar you can reasonably afford. When buying an electric, it is really important to listen to the guitar acoustically (not plugged in). This is not always easy in a noisy music shop, so try to visit at a quiet time (early morning is usually good, because most musos are still in bed!) In particular, listen for an even response (no boomy or dead notes), and for a lively but full sound with reasonable sustain. If the guitar is good acoustically, it is easy to make it sound good electrically, even if you need to replace some hardware over time. And finally, the good news. There are a some very basic things you can do to improve tone. Alone they make a small difference, but together they can do a lot. Keep your strings and fretboard clean. Don't waste your time with dead strings, either. Look after your equipment and keep it well maintained. Power amp valves need to be replaced occasionally. Sort out any equipment problems, such as mismatched impedances or levels. Analogue equipment can clip occasionally, digital equipment should never clip. Take care of your hearing; no point in having the ultimate tone if you can't hear it!